The Ketogenic Diet for Health: How much protein is enough? It is commonly assumed that excess protein gets immediately turned into glucose by gluconeogenesis. However, we've shown in a series of articles (part 1, part 2, part 3, part 4) that such a mechanism is highly unlikely — excess protein does not just get immediately turned into glucose. The evidence points to gluconeogenesis being driven by demand for glucose, not supply of protein. However, it does appear that above a certain level of protein intake ketogenesis declines. So regardless of mechanism, as ketogenic dieters, we probably still need to limit protein. It's not clear how much is too much. But how much is enough? It is important not to turn a healthy, ketogenic diet into an unhealthy starvation diet! In this article we review some answers to this question, and some unanswered questions. It's important to get enough protein. The RDA for protein is too low: if you are like most people, your health will suffer if you eat as little protein as the RDA requires. Getting the minimum may not be optimal, but getting less than the minimum would be a mistake. There are several different conditions that are commonly believed to affect protein requirements. In particular, exercise and weight loss have both been said to increase protein needs. We couldn't find definitive support for either of those beliefs. We are most interested in studies that apply to keto dieters. Evidence from experiments on the Protein-Sparing Modified Fast is quite likely to apply to keto dieters. However, experiments on Protein-Sparing Modified Fasts leave out an important factor: fat intake, which may reduce protein requirements by reducing the need to use protein for energy. Let's head off confusion by distinguishing different ways to measure protein intake. You'll sometimes see protein intake expressed in terms of percent of total calorie intake. For example, the USDA recommends 10-35% of calories from protein. But this measures how much you are eating, not how much you are using! If you are losing weight, then (hopefully!) some of the calories you are burning are coming from your body fat instead of from your diet. Measuring protein requirements as a percent of intake ignores those calories. In this case, the percent of protein you are eating would be higher than the percent you are using. A better way to express protein requirements is in terms of body weight. You are made in large part out of protein and so the more of you there is, the more protein you need to maintain your structures. We have seen protein requirements in the form of percent of your ideal body weight, percent of your lean mass, or simply percent of your body weight. These make more sense than percent of calories in this context. Protein is necessary for virtually every biological process. Enzymes, antibodies, cellular receptors, and collagen are just a few examples of protein structures, but there are maybe 2 million different proteins functioning in the body . Getting too little protein to provide for these structures could adversely affect many aspects of health, especially growth and maintenance of bone and muscle, and immune function , , . Although the body recycles the amino acids that proteins are built from (this is called protein “turnover”), there are also constant losses that need to be replaced (“obligatory nitrogen losses”) . The lowest estimates of minimum requirements we have seen is the USDA RDA (it's now called RDI) of 0.8g per kg of body weight per day (for adults) . Even they admit, in their 1000+ page explanation of macronutrient RDAs (RDAs for protein, fat and carbohydrate) from the Institute of Medicine, that the method they used to determine adequate protein levels (called “nitrogen balance”) is likely to result in underestimates . Because of this, and because there was a flaw in the mathematical model that was used to derive the recommendations, a 2010 study reanalysed the same data that was used to generate the USDA RDA recommendations. They concluded that the recommendations should be 50% higher than they are . That is, they conclude that for most people, 1.2g/kg/day of protein intake is necessary. There is also experimental evidence that suggests the RDA is inadequate . An issue with using the results of these studies, is that, as with any physiological experiments, when you change the base conditions, the results may suddenly no longer apply. Changes that might make these conclusions inapplicable include what happens during high levels of physical activity, weight loss, or when consuming different levels of macronutrients. Specifically we want to know if protein requirements change when keto-adapted. Whether higher levels of exercise increase protein needs is controversial. Some studies suggest that endurance exercise increases the need for protein because protein is oxidised (used for energy) during the exercise . However, there is also evidence that after a period of training this oxidation is limited by downregulation of the necessary enzymes . That is, after doing it regularly, the body learns to spare the protein and stops letting it be used in that way. In particular, it is the BCAAs (branched chain amino acids) that appear to be oxidised . Since BCAAs are known to be elevated in keto dieters, it's possible that any such effect would be minimal for us in the first place or that the downregulation has already taken place. In fact, infusing people with beta-hydroxybutyrate (the ketone body we check for in the blood to see if someone is in deep ketosis) reduces leucine oxidation and promotes protein synthesis . As for weight lifting, it seems intuitive that if you are building muscle, you will need more protein. Some studies seem to show this, but others actually show the reverse , , . The subjects in those studies, of course, were not on keto diets. These facts taken together seem to suggest that when you adapt to a hormonal state that favours muscle preservation or gain, whether it is a ketogenic state, or the state of regular exercise stimulus, it reduces the need for protein. Indeed, ketosis is known to be protein-sparing, and that may mean that you actually need less protein. We have seen it asserted that weight loss itself increases the need for protein. However, the only studies we have seen that claim to prove it are flawed , . It is still possible that weight loss requires more protein, but we haven't yet been convinced either way. Note that this is different from the claim that higher protein diets improve weight loss (even when carbohydrates are not ketogenically low), which has shown repeatedly , , , , . Since protein is generally taking the place of carbohydrate, we would certainly expect that to be true. Relatedly, it is often claimed that weight loss is necessarily accompanied by some loss of lean mass. This has a plausible mechanism. For one thing, in people with lots of excess fat, more muscle, bone, and other infrastrucure has been built to carry the excess weight, and as the stimulus of the weight of the fat recedes, the extra muscle built to hold it might atrophy. Nonetheless, there are some studies of keto diets used for weight loss in which lean mass was preserved or even increased, for example in  and . Since retaining lean mass requires sufficient protein (among other things), studies in which keto dieters retained lean mass must have been protein adequate. Note that the reverse is not true: if a study had keto dieters losing lean mass, that doesn't imply that protein intake was inadequate. Other factors, such as mineral intake , and activity level and type  can effect muscle retention. One particular kind of ketogenic weight loss diet that specifically aims to provide just enough protein to prevent muscle loss is called a Protein-Sparing Modified Fast. The developers of the Protein-Sparing Modified Fast were hypothesising that fasting would be the perfect therapy for the treatment of obesity, if it weren't for the resulting detrimental and dangerous loss of lean mass. They discovered that by adding enough protein, subjects lost fat effectively, but without losing lean mass. In particular, it was found that males preserved lean mass at 1.4 g/kg ideal body weight, and females at 1.2 g/kg ideal body weight . This is particularly relevant for us, since the Protein-Sparing Modified Fast is a ketogenic condition. In addition to the effects of being keto-adapted, we would like to know what the effect of the amount of fat in the diet has, if any, on protein requirements. It is plausible that if for some reason the rate of oxidation of fat stores were limited, that some dietary protein might be oxidised for fuel. If this were the case, then the addition of fat should lessen protein requirements. In other words, if there is a rate limit to getting fat out of fat stores, then adding sufficient dietary fat to make up for the energy requirements not met by adipose tissue would spare protein. On a keto diet, since carbohydrates are limited, and protein levels that are too high are undesirable (though how high is "too high" is not well understood), energy balance is made up by dietary fat. (And besides, fat is an important source of essential fatty acids and nutrients.) Unfortunately, we don't know of studies that test this in either weight loss or weight maintenance conditions. defending the body against disease, e.g. antibodies. Castaneda C, Charnley JM, Evans WJ, Crim MC. Am J Clin Nutr. 1995 Jul;62(1):30-9. "A 9-wk study of adaptation to marginal protein intakes was conducted in 12 elderly women. Subjects were randomly assigned to two groups fed a weight-maintenance diet containing either 1.47 (low) or 2.94 (adequate) g protein.kg body cell mass-1.d-1 (0.45 and 0.92 g.kg body wt-1.d-1, respectively). Mean nitrogen balance in the low-protein group remained negative throughout the study. These subjects experienced significant losses in lean tissue, immune response, and muscle function. The adequate-protein group was in nitrogen balance throughout the study, without changes in lean tissue, and with improvements in immune response, serum immunoglobulins, albumin, total protein values, and muscle function. Thus, elderly women fed the low-protein diet accommodated to the diet by compromising functional capacity, whereas those fed the adequate diet maintained functional capacity." Amino acids and immune function. Peng Li, Yu-Long Yin, Defa Li, Sung Woo Kim and Guoyao Wu. "A deficiency of dietary protein or amino acids has long been known to impair immune function and increase the susceptibility of animals and humans to infectious disease. However, only in the past 15 years have the underlying cellular and molecular mechanisms begun to unfold. Protein malnutrition reduces concentrations of most amino acids in plasma. Findings from recent studies indicate an important role for amino acids in immune responses by regulating: (1) the activation of T lymphocytes, B lymphocytes, natural killer cells and macrophages; (2) cellular redox state, gene expression and lymphocyte proliferation; and (3) the production of antibodies, cytokines and other cytotoxic substances. Increasing evidence shows that dietary supplementation of specific amino acids to animals and humans with malnutrition and infectious disease enhances the immune status, thereby reducing morbidity and mortality." Bonjour JP, Ammann P, Chevalley T, Rizzoli R.
Can J Appl Physiol. 2001;26 Suppl:S153-66. "Among osteotrophic nutrients, proteins play an important role in bone development, thereby influencing peak bone mass. Consequently, protein malnutrition during development can increase the risk of osteoporosis and of fragility fracture later in life. Both animal and human studies indicate that low protein intake can be detrimental for both the acquisition of bone mass during growth and its conservation during adulthood. Low protein intake impairs both the production and action of IGF-I (Insulin-like growth factor-I). IGF-I is an essential factor for bone longitudinal growth, as it stimulates proliferation and differentiation of chondrocytes in the epiphyseal plate, and also for bone formation. It can be considered as a key factor in the adjustments of calcium-phosphate metabolism required for normal skeletal development and bone mineralization during growth. In healthy children and adolescents, a positive association between the amount of ingested proteins and bone mass gain was observed in both sexes at the level of the lumbar spine, the proximal femur and the midfemoral shaft. This association appears to be particularly significant in prepubertal children. This suggests that, like for the bone response to either the intake of calcium or weight-bearing exercise, the skeleton would be particularly responsive to the protein intake during the years preceding the onset of pubertal maturation." Protein quality, amino acid balance, utilization, and evaluation of diets containing amino acids as therapeutic agents. "As protein deficiency declines, the efficiency with which amino acids are reutilized increases, but small amounts of amino acids are continuously degraded, and their nitrogen is lost from the body even when no protein is being consumed. These losses are termed obligatory nitrogen losses. If protein intake declines below the amount of these obligatory losses, the amount of nitrogen excreted by the body will exceed the amount consumed, and the body will be in a state of negative nitrogen balance. As protein intake is increased, nitrogen balance will become less negative until, at some point, a steady state will be reached such that nitrogen intake will equal nitrogen loss; i.,e., nitrogen balance will be zero. An estimate of adult requirements for protein or amino acids can therefore be obtained from measurement of the minimum amount of protein or amino acid nitrogen that must be consumed to just balance body nitrogen losses." "The nitrogen balance method does have substantial practical limitations and problems. First, the rate of urea turnover in adults is slow, so several days of adaptation are required for each level of dietary protein tested to attain a new steady state of nitrogen excretion (Meakins and Jackson, 1996; Rand et al., 1976). Second, the execution of accurate nitrogen balance measurements requires very careful attention to all the details of the procedures involved. Since it is easy to overestimate intake and underestimate excretion, falsely positive nitrogen balances may be obtained (Hegsted, 1976). Indeed, an overestimate of nitrogen balance seems consistent throughout the literature because there are many observations of quite considerable apparent retention of nitrogen in adults (Oddoye and Margen, 1979). This observation is biologically implausible because (a) adults do not normally accrete body protein, and (b) the magnitude of the positive nitrogen balances is inconsistent with stability of body weight." Comment: That last statement is odd. It could be seen as denying the evidence. We actually find it plausible that adults could accrete protein to a greater extent than currently assumed (more on this in a subsequent post). And of course, as every dieter knows, body weight can be stable even while lean mass is increasing, if fat is simultaneously decreasing. Elango R, Humayun MA, Ball RO, Pencharz PB. Curr Opin Clin Nutr Metab Care. 2010 Jan;13(1):52-7. "This review discusses recent evidence that suggests a significant underestimation of protein requirements in adult humans. Traditionally, total protein requirements for humans have been determined using nitrogen balance. The recent Dietary Reference Intake recommendations for mean and population-safe intakes of 0.66 and 0.8 g/kg/day, respectively, of high-quality protein in adult humans are based on a meta-analysis of nitrogen balance studies using single linear regression analysis. We reanalyzed existing nitrogen balance studies using two-phase linear regression analysis and obtained mean and safe protein requirements of 0.91 and 0.99 g/kg/day, respectively. The two-phase linear regression analysis is considered more appropriate for biological analysis of dose-response curves. Considering the inherent problems associated with the nitrogen balance method, we developed an alternative method, the indicator amino acid oxidation technique, to determine protein requirements The mean and population-safe requirements in adult men were determined to be 0.93 and 1.2 g/kg/day and are 41 and 50%, respectively, higher than the current Dietary Reference Intakes recommendations. The indicator amino acid oxidation-based requirement values of 0.93 and 1.2 g protein/kg/day and the reanalysis of existing nitrogen balance studies are significantly higher than current recommendations. Therefore, there is an urgent need to reassess recommendations for protein intake in adult humans." The skeletal muscle transcript profile reflects accommodative responses to inadequate protein intake in younger and older males. J Nutr Biochem. 2010 November; 21(11): 1076–1082. "Previous studies have suggested that the current RDA for protein (0.8 g•kg−1•d−1) is inadequate to maintain protein homeostasis [5, 32-34], fat-free mass, and skeletal muscle cross-sectional area in older adults [7, 35] while protein intake above the RDA may be needed to maintain lean body mass and type I muscle fiber cross sectional area in older women [5, 6]. The results of our study reveal a molecular signature of a biological response to inadequate dietary protein intake that is consistent with this hypothesis. We believe that the observation that transcripts for “muscle and organ development” and “cell differentiation” increase when the protein intake is greater than the RDA (i.e. cluster C5 in Figure 1) and previous phenotypic data [5-7, 32-35] suggest that there are positive responses to consuming protein in quantities greater than the RDA in skeletal muscle. Thus, our array data are consistent with previous reports that suggest a higher protein intake contributes to a healthier physiological profile [5, 6, 36] and better muscle responses to resistance training . The study duration was not, however, sufficient to directly link changes in the skeletal muscle transcript profile with previously reported phenotypes of adaptation and accommodation [5-7, 32-35]." Moderate physical activity can increase dietary protein needs. Lemon PW, Dolny DG, Yarasheski KE. Can J Appl Physiol. 1997 Oct;22(5):494-503. "Six healthy men completed three 1-hr bouts of treadmill walk-jogging at low (L; 42 +/- 3.9% VO2max), moderate (M; 55 +/- 5.6%), and high (H; 67 +/- 4.5%) exercise intensity in order to determine whether moderate physical activity affects dietary protein needs. Both sweat rate and sweat urea N loss were greater (p < .10) with increasing exercise intensity. Seventy-two hour postexercise urine urea N excretion was elevated (p < .05) over nonexercise control (26.6 +/- 2.96 g) with both M (31.0 +/- 3.65) and H (33.6 +/- 4.39), but not L (26.3 +/- 1.86), intensities. Total 72-hr postexercise urea N excretion (urine + sweat) for the M and H exercise was greater than control by 4.6 and 7.2 g, respectively. This suggests that 1 hr of moderate exercise increases protein oxidation by about 29-45 g, representing approximately 16-25% of the current North American recommendations for daily protein intake. These data indicate that the type of exercise typically recommended for health/wellness can increase daily protein needs relative either to sedentary individuals or to those who exercise at lower intensities." Protein requirements for endurance athletes. "Human skeletal muscle can oxidize at least eight amino acids (alanine, asparagine, aspartate, glutamate, isoleucine, leucine, lysine, and valine; 70); however, during exercise, the branched-chain amino acids (BCAA: isoleucine, leucine, and valine) are preferentially oxidized (43, 49, 58, 70). The BCAA are transaminated to their keto-acids via branched-chain aminotransferase (BCAAT), with subsequent oxidation occurring via branched-chain oxo-acid dehydrogenase enzyme (BCOAD; 8, 9). The amino-N group is usually transaminated with α-ketoglutarate to form glutamate, which is then transaminated with pyruvate to form alanine or aminated via glutamine synthase to form glutamine (15, 57). The BCOAD enzyme is rate limiting in BCAA oxidation, with about 5 to 8% being active (dephosphorylated) at rest, and 20 to 25% being active during exercise (8, 49)." Nair KS, Welle SL, Halliday D, Campbell RG. J Clin Invest. 1988 Jul;82(1):198-205. "Because intravenous infusion of beta-hydroxybutyrate (beta-OHB) has been reported to decrease urinary nitrogen excretion, we investigated in vivo metabolism of leucine, an essential amino acid, using L-[1-13C]leucine as a tracer during beta-OHB infusion. Leucine flux during beta-OHB infusion did not differ from leucine flux during normal saline infusion in nine normal subjects, whereas leucine oxidation decreased 18-41% (mean = 30%) from 18.1 +/- 1.1 mumol.kg-1.h-1 (P less than 0.01), and incorporation of leucine into skeletal muscle protein increased 5-17% (mean = 10%) from 0.048 + 0.003%/h (P less than 0.02). Since blood pH during beta-OHB infusion was higher than the pH during saline infusion, we performed separate experiments to study the effect of increased blood pH on leucine kinetics by infusing sodium bicarbonate intravenously. Blood pH during sodium bicarbonate infusion was similar to that observed during the beta-OHB infusion, but bicarbonate infusion had no effect on leucine flux or leucine oxidation. We conclude that beta-OHB decreases leucine oxidation and promotes protein synthesis in human beings." Effects of resistance training on protein utilization in healthy children. Pikosky M, Faigenbaum A, Westcott W, Rodriguez N.
Med Sci Sports Exerc. 2002 May;34(5):820-7. "Healthy children (N = 11, 8.6 +/- 1.1 yr, 33.7 +/- 9.4 kg, 131 +/- 9.6 cm, BMI = 19.1 +/- 3.4) participated in a supervised resistance-training program 2 times.wk-1 for 6 wk. 15N glycine methodology was used to assess nitrogen flux (Q), protein synthesis (PS), protein breakdown (PB), and net turnover ([NET] = PS - PB) before (PRE) and after (POST) resistance training. Percent body fat (%BF), fat-free mass (FFM), fat mass (FM), and energy and protein intakes were also determined. PRE/POST measurements of 1RM for the chest press and leg extension were used to examine strength gains. Gains associated with the chest press and leg extension were 10% and 75% (P < 0.001), respectively. Significant increases (P < 0.05) were noted for weight, height, FFM, and FM. Energy and protein intake remained constant. Significant decreases (PRE vs POST) were observed for Q (1.22 +/- 0.1 vs 0.75 +/- 0.05 gN.kg-1.d-1, P < 0.001), PS (6.48 +/- 0.47 vs 3.55 +/- 0.30 g.kg-1.d-1, P < 0.001), and PB (5.24 +/- 0.41 vs 2.96 +/- 0.30 g.kg-1.d-1, P < 0.01) after 6 wk of resistance training. NET was also reduced (P = 0.07, 1.24 +/- 0.31 vs 0.59 +/- 0.20 g.kg-1.d-1). Resistance training resulted in a downregulation in protein metabolism, which may be energy based. Future studies are needed to clarify energy, as well as protein, needs in young children participating in this form of exercise." Resistance training reduces whole-body protein turnover and improves net protein retention in untrained young males. Hartman JW, Moore DR, Phillips SM. Appl Physiol Nutr Metab. 2006 Oct;31(5):557-64. "It is thought that resistance exercise results in an increased need for dietary protein; however, data also exists to support the opposite conclusion. The purpose of this study was to determine the impact of resistance exercise training on protein metabolism in novices with the hypothesis that resistance training would reduce protein turnover and improve whole-body protein retention. Healthy males (n = 8, 22 +/- 1 y, BMI = 25.3 +/- 1.8 kg.m(-2)) participated in a progressive whole-body split routine resistance-training program 5d/week for 12 weeks. Before (PRE) and after (POST) the training, oral [15N]-glycine ingestion was used to assess nitrogen flux (Q), protein synthesis (PS), protein breakdown (PB), and net protein balance (NPB = PS-PB). Macronutrient intake was controlled over a 5d period PRE and POST, while estimates of protein turnover and urinary nitrogen balance (N(bal) = N(in) - urine N(out)) were conducted. Bench press and leg press increased 40% and 50%, respectively (p < 0.01). Fat- and bone-free mass (i.e., lean muscle mass) increased from PRE to POST (2.5 +/- 0.8 kg, p < 0.05). Significant PRE to POST decreases (p <0.05) occurred in Q (0.9 +/- 0.1 vs. 0.6 +/- 0.1 g N.kg(-1).d(-1)), PS (4.6 +/- 0.7 vs. 2.9 +/- 0.3 g.kg(-1).d(-1)), and PB (4.3 +/- 0.7 vs. 2.4 +/- 0.2 g.kg(-1).d(-1)). Significant training-induced increases in both NPB (PRE = 0.22 +/- 0.13 g.kg(-1).d(-1); POST = 0.54 +/- 0.08 g.kg(-1).d(-1)) and urinary nitrogen balance (PRE = 2.8 +/- 1.7 g N.d(-1); POST = 6.5 +/- 0.9 g N.d(-1)) were observed. A program of resistance training that induced significant muscle hypertrophy resulted in reductions of both whole-body PS and PB, but an improved NPB, which favoured the accretion of skeletal muscle protein. Urinary nitrogen balance increased after training. The reduction in PS and PB and a higher NPB in combination with an increased nitrogen balance after training suggest that dietary requirements for protein in novice resistance-trained athletes are not higher, but lower, after resistance training." Resistance training reduces fasted- and fed-state leucine turnover and increases dietary nitrogen retention in previously untrained young men. Moore DR, Del Bel NC, Nizi KI, Hartman JW, Tang JE, Armstrong D, Phillips SM. "We aimed to determine the impact of intense resistance training, designed to increase lean body mass (LBM), on both fasted and fed whole body protein kinetics in untrained young men. Twelve healthy males (22 +/- 2 y of age; BMI, 24.3 +/- 2.4 kg/m(2)) participated in a 12-wk (5-d/wk) resistance training program. Before and after training, a primed constant infusion of [1-(13)C]leucine was used to measure whole body leucine turnover, protein breakdown, and nonoxidative leucine disposal in the fasted and fed states. Participants were studied during 5-d controlled diet periods that provided a moderate protein intake [1.4 g/(kg body wt . d)]. We estimated protein turnover and nitrogen balance. Training increased LBM (61.6 +/- 6.9 vs. 64.8 +/- 6.7 kg, P < 0.05). After training, whole body leucine turnover was reduced (P < 0.01) in both fasted (167 +/- 18 vs. 152 +/- 17) and fed (197 +/- 23 vs. 178 +/- 21) states [all values micromol/(kg LBM . h)]. Training-induced decreases (P < 0.01) in protein breakdown occurred in the fasted (165 +/- 18 vs. 144 +/- 17) and fed (111 +/- 23 vs. 93 +/- 20) states. Following training, nonoxidative leucine disposal was similarly reduced (P < 0.01) in the fasted (144 +/- 18 vs. 126 +/- 18) and fed (151 +/- 20 vs. 133 +/- 19) states. Nitrogen balance was more positive after training (13.7 +/- 8.1 vs. 33.4 +/- 12.5 g/(kg LBM . d), P < 0.01) indicating an increased retention of dietary nitrogen. Intense resistance training alters whole body protein kinetics in novice weightlifters regardless of feeding status. The increase in nitrogen balance after training demonstrates a more efficient utilization of dietary nitrogen, suggesting that protein requirements for novice weightlifters are not elevated." L J Hoffer, B R Bistrian, V R Young, G L Blackburn, and D E Matthews. J Clin Invest. 1984 March; 73(3): 750–758. "A randomized comparison trial of two very low calorie weight reduction diets was carried out for 5 or 8 wk in 17 healthy obese women. One diet provided 1.5 g protein/kg ideal body weight; the other provided 0.8 g protein/kg ideal body weight plus 0.7 g carbohydrate/kg ideal body weight. The diets were isocaloric (500 kcal). Amino acid metabolism was studied by means of tracer infusions of L-[1-13C]leucine and L-[15N]alanine. After 3 wk of adaptation to the diets, nitrogen balance was zero for the 1.5 g protein diet but -2 g N/d for the 0.8 g protein diet. Postabsorptive plasma leucine and alanine flux decreased from base line by an equal extent with both diets by approximately 20 and 40%, respectively. It was concluded that protein intakes at the level of the recommended dietary allowance (0.8 g/kg) are not compatible with nitrogen equilibrium when the energy intake is severely restricted, and that nitrogen balance is improved by increasing the protein intake above that level. Basal rates of whole body nitrogen turnover are relatively well maintained, compared with total fasting, at both protein intakes. However, turnover in the peripheral compartment, as evidenced by alanine flux, may be markedly diminished with either diet." Comment: The authors have assumed that the RDA is adequate, which would imply that the condition of weight loss had increased protein needs. However, since we have seen that the RDA is not, in fact adequate, the conclusion is unwarranted. I.e., the study was not controlled for people not losing weight. Effects of caloric or protein restriction on insulin-like growth factor-I (IGF-I) and IGF-binding proteins in children and adults. W J Smith, L E Underwood and D R Clemmons. "Sixteen adult subjects (7 males and 9 females), aged 22-40 yr, were recruited and assessed in the same manner as the children [i.e. by advertisement, and determined to be healthy by a battery of tests.] They consumed a diet that provided 35 Cal/kg IBW and 1 g protein/kg IBW for the first 3 study days. Nonprotein calories were provided as 70% carbohydrate and 30% lipid. On study days 4-9, half of the 16 subjects received only 17 Cal/kg IBW, but continued to receive 1 g protein/kg IBW. "During the 6 days of calorie restriction, the adults lost 1.7 2 0.1 kg (mean 2 SD) [...]. Baseline nitrogen balance in the adults (mean of days 2 and 3) was -82 2 47 mmol/day (mean + SE) and declined to -196 2 40 mmol/day (the mean of study days 8 and 9; P < 0.05)." Comment: The authors showed that when healthy adults were given a constant amount of protein, but two different levels of calories, nitrogen balance was more negative in the lower calorie condition. However, both diets were still high enough in carbohydrate to be non-ketogenic, and the difference between the diets was primarily a carbohydrate difference. In a non-keto-adapted state, carbohydrates can spare protein, because your metabolism is much more dependent on glucose for fuel. That means that reducing carbohydrates will require more protein for gluconeogenesis. After keto-adaptation, many tissues use ketones instead, and this spares protein. So we would expect that lowering carbohydrates without keto-adapting would negatively affect nitrogen balance. Therefore, we can't conclude that the negative nitrogen balance in this study reflects increased protein needs from caloric restriction alone, because it could be that the same caloric deficit in a keto-adapted state would have different results. It would be interesting to see an analogue of this study in keto-adapted people. We are not aware of any such study. High protein vs high carbohydrate hypoenergetic diet for the treatment of obese hyperinsulinemic subjects. Baba NH, Sawaya S, Torbay N, Habbal Z, Azar S, Hashim SA. Int J Obes Relat Metab Disord. 1999 Nov;23(11):1202-6. "Thirteen male obese hyperinsulinemic normoglycemic subjects were divided into two groups and fed hypoenergetic diets providing 80% of their resting energy expenditure (REE). One group received a high-protein diet (HP; 45% protein, 25% carbohydrates, and 30% fat as percent of dietary energy) and the other a high-carbohydrate diet (HC; 12% protein, 58% carbohydrates and 30% fat). "Weight loss was higher in the HP than HC group (8.3+/-0.7 vs 6.0+/-0.6 kg, P<0. 05). There was a decrease in body fat in both groups, whereas body water decreased significantly more in the HP group. REE decreased more in the HC than the HP group (-384.3+/-84.6 vs -132.3+/-51.0 kcal, P<0.05). Serum total cholesterol, triglycerides and LDL cholesterol decreased significantly to a similar extent in both diet groups, while HDL cholesterol was decreased significantly only in the HP group. Mean fasting insulin decreased significantly in both diet groups and reached the normal range only in the HP group." Effects of protein vs. carbohydrate-rich diets on fuel utilisation in obese women during weight loss. Labayen I, Díez N, González A, Parra D, Martínez JA. "DESIGN: Eleven obese (BMI>30) women were randomly assigned to a 10w dietary intervention study comparing HP (30% protein) or HC (55% carbohydrate) energy restricted diets providing 30% energy fat content. Substrate utilisation was evaluated by indirect calorimetry. Body weight and composition (Bod Pod) and blood measurements were performed before and after weight loss. 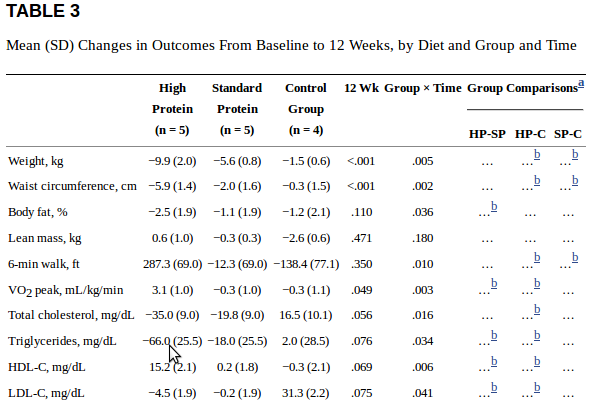 RESULTS: On average, the individuals on the HP dietary group lost 4.4 kg more than those in the HC program (p<0.50), which was mainly due to a fat mass loss (3.7 kg, p<0.05) with no statistical differences in lean body mass reduction. These losses were accompanied by a significant decrease in fasting leptin in the HP group (-52%; P<0.05). On the other hand post-absorptive lipid oxidation decreased in the HC group (-48%) and remained unchanged in the HP groups. CONCLUSIONS: The replacement of some dietary carbohydrate by protein in energy restricted diets, improves weight and fat losses and specifically promotes lipid oxidation in the fasting state, without major different in lean body mass depletion." Reduced body weight and adiposity with a high-protein diet improves functional status, lipid profiles, glycemic control, and quality of life in patients with heart failure: a feasibility study. Evangelista LS, Heber D, Li Z, Bowerman S, Hamilton MA, Fonarow GC. J Cardiovasc Nurs. 2009 May-Jun;24(3):207-15. doi: 10.1097/JCN.0b013e31819846b9. "[T]his feasibility study was conducted to compare the effects of an HP, hypoenergetic diet (40% total energy from carbohydrates, 30% from protein, and 30% from fat), a standard protein (SP), hypoenergetic diet (55% total energy from carbohydrates, 15% from protein, and 30% from fat), and a conventional diet (high carbohydrates, low fat, high fiber, with no energy restrictions) on body weight and adiposity in patients with HF and increased BMI greater than or equal to 27 kg/m2 and DM. "The current report reflects data from the first 14 patients who consented to participate in the study; recruitment and enrollment are still ongoing. The patients were randomized to the HP (n = 5), SP (n = 5), and conventional diets (n = 4), respectively. Comment: Gee, look at that cholesterol. Not quite statistically significant (because the group size was small) but highly suggestive. Pasiakos SM, Cao JJ, Margolis LM, Sauter ER, Whigham LD, McClung JP, Rood JC, Carbone JW, Combs GF Jr, Young AJ. FASEB J. 2013 Sep;27(9):3837-47. doi: 10.1096/fj.13-230227. "The purpose of this work was to determine the effects of varying levels of dietary protein on body composition and muscle protein synthesis during energy deficit (ED). A randomized controlled trial of 39 adults assigned the subjects diets providing protein at 0.8 (recommended dietary allowance; RDA), 1.6 (2×-RDA), and 2.4 (3×-RDA) g kg(-1) d(-1) for 31 d. A 10-d weight-maintenance (WM) period was followed by a 21 d, 40% ED. Body composition and postabsorptive and postprandial muscle protein synthesis were assessed during WM (d 9-10) and ED (d 30-31). Volunteers lost (P<0.05) 3.2 ± 0.2 kg body weight during ED regardless of dietary protein. The proportion of weight loss due to reductions in fat-free mass was lower (P<0.05) and the loss of fat mass was higher (P<0.05) in those receiving 2×-RDA and 3×-RDA compared to RDA. The anabolic muscle response to a protein-rich meal during ED was not different (P>0.05) from WM for 2×-RDA and 3×-RDA, but was lower during ED than WM for those consuming RDA levels of protein (energy × protein interaction, P<0.05). To assess muscle protein metabolic responses to varied protein intakes during ED, RDA served as the study control. In summary, we determined that consuming dietary protein at levels exceeding the RDA may protect fat-free mass during short-term weight loss." Diabetes Metab Res Rev. 2010 Jul;26(5):393-405. doi: 10.1002/dmrr.1097. "Obese subjects received instructions for an energy-restricted diet with a calorie deficit of 500 kcal/day and were randomly assigned to either high-protein (1.34 g/kg body weight) or conventional protein (0.8 g/kg body weight) diets for 12 months. Protein-enriched meal replacements were used to enrich one arm of the diet with protein throughout the study. In all, 67% of the participants completed the 1-year study. "RESULTS Subjects following the high-protein diet lost more body weight and more fat mass compared with those on the conventional protein diet, whereas the loss of fat-free mass was similar in both diet groups. Biochemical parameters associated with the metabolic syndrome improved in both diet groups. Improvements were modestly greater in subjects with the high-protein diet. After 12 months of treatment, 64.5% of the subjects in the high-protein diet group and 34.8% of the subjects in the conventional diet group no longer met three or more of the criteria for having the metabolic syndrome." "A clue to what was happening in this "Turkey Study" could be found in the potassium balance data provided in this report. Normally, nitrogen and potassium gains or losses are closely correlated, as they both are contained in lean tissue. Interestingly, the authors noted that the protein only diet subjects were losing nitrogen but gaining potassium. As noted in a rebuttal letter published soon after this report , this anomaly occurred because the authors assumed the potassium intake of their subjects based upon handbook values for raw turkey, not recognizing that half of this potassium was being discarded in the unconsumed broth. Deprived of this potassium (and also limited in their salt intake), these subjects were unable to benefit from the dietary protein provided and lost lean tissue. Also worthy of note, although this study was effectively refuted by a well-designed metabolic ward study published 3 years later , this "Turkey Study" continues to be quoted as an example of the limitations of low carbohydrate weight loss diets." Low-carbohydrate diets promote a more favorable body composition than low-fat diets. Volek, Jeff S., Erin E. Quann, and Cassandra E. Forsythe. Strength & Conditioning Journal 32.1 (2010): 42-47. "We performed a similar experiment in overweight/obese men who were placed in a low-fat diet group that restricted fat to less than 25% of energy or a very low–carbohydrate ketogenic diet group that reduced carbohydrate to less than 15% energy. Both groups also participated in a resistance training program (see Practical Applications) (16). Body composition was assessed using dual energy x-ray absorptiometry before and after the 12-week program. The results were compared with non-training diet only groups. As expected, the low-carbohydrate diet group lost more fat, which was associated with greater decreases in insulin. Resistance training, independent of diet, resulted in increased lean body mass without compromising fat loss in both diet groups. The most dramatic reduction in percent body fat was in the low-carbohydrate diet resistance training group (25.3%), followed by low-fat resistance training(23.5%), low-carbohydrate diet only (23.4%), and low-fat diet only (22.0%) groups. These data show for the first time that resistance training is a potent stimulus to protect lean body mass in men consuming a low-carbohydrate diet, while still allowing for significantly greater fat loss." Multidisciplinary approach to obesity utilizing fasting modified by protein-sparing therapy. "The question that remained to be answered was what amount of protein was necessary to maintain positive energy nitrogen balance ⁹³ for a time sufficient to allow the obese individual to reach his normal size. "Blackburn, et al investigated this question while also measuring the biochemical and clinical aspects of what he termed the protein-sparing modified fast (PSMF). One hundred forty-six patients (111 outpatients) were followed at the Massachusetts Institute of Technology Clinical Research Center while undergoing a comprehensive weight reduction program that included nutritional education, behavior modification, exercise, and the PSMF. ⁹⁴'⁹⁵ He found that in males, nitrogen (N) balance was obtained at 1.4 gm protein daily/kg ideal body weight (IBW) and in females, N balance was obtained at 1.2 gm/kg IBW. Outpatients tolerated the PSMF well in a wide variety of lifestyles and occupations and invariably found it easier than a balanced deficit diet. Ingestion of 40 to 80 gm of carbohydrate in addition to protein, however, markedly reduced ketosis and reistated hunger.⁹⁶"
Brilliant, Amber. I enjoy your posts so much. Thanks for taking the time and effort to research the issues pertinent to ketogenic diets so thoroughly. "The evidence points to gluconeogenesis being driven by demand for glucose, not supply of protein." A big factor in all this is the folly of defining stuff by macronutrient, sorta dumbs it down a little too much. Using an online food calculator or reading labels might show that you yield 120g of protein for the day - ace right? What if most of that is gluten and casein and peanut and soy proteins? Bad news - even though you're still capable of doing it technically ketogenic, even by chugging Crisco and eating peanut butter on tofu. If we MUST delineate things to as simple as possible, I propose just splitting the protein macro labelling to "animal proteins" and "other junk". I know, a bit specious - but it's a more important distinction than the whole "net carbs" malarkey that LC'ers obsess over. On the GNG issue, many folk talk about higher protein needs because lack of exogenous carbs therefore the brain/etc will be starved of glucose and will need to break down structural protein. This is true in actual starvation (deficiency of both glucose AND ketones), but in fat-replete keto it's far from the full story, whereby a good portion (sorry, don't have my cites for amount handy) of glucose can be generated as a side effect of fatty acid burning. I, too, think the point about what drives GNG is important, but I can see how if all you want to know is whether or not it effects ketosis, then it doesn't matter much how it happens. I agree that starvation is a poor model. It is an unfortunate accident of scientific history that starvation is the lens through which much of ketogenesis is viewed. I'm curious about ad libitum consumption of protein whilst keto-adapted. I initially tracked my animal protein, but now just eat to hunger. I can't seem to eat more than about 60-70 grams of protein a day; I just don't want any more. It just so happens that at 57 kg, I am right on target most days. If I under-eat protein one day, I will make up for it the next. I am vlc at about 40 gm carbs per day, moderately active. I suspect many people get a lowering of appetite for protein that naturally gets them to the sweet spot. I have just noticed that I appear to be sensitive to dairy (cream and possibly butter) in that I have started losing weight again after dropping those (without conscious restriction). I haven't been able to verify whether the effect was associated with lower ketones, though, as I have no measuring strips right now. I wrote about it on my personal blog. However, it also seems plausible that some people eating ad libitum could fall into a cycle where they eat enough protein to be out of ketosis, and then that raises their appetites, so that they continue to eat more protein. One could imagine that if they lowered protein on purpose despite hunger for a couple of days, then this would go away, and they would be satisfied on less again. Again, the times that I have tried it when eating dairy, the hunger never went away. I did try it briefly since giving up dairy and it was easy and hungerless. When I get some keto-strips, I'll do a more careful experiment. Loved your personal blog post, as well as this one! I'm wondering about dropping dairy again. I did it way back when I first went vlc Primal (for 6 weeks,) but it didn't do anything except make me feel deprived. With only ~ 3 lbs to go to reach my ideal body fat percentage, I am tempted to experiment. Think I will wait until Spring, though. For now, I will just continue to intermittent fast and eat smaller portions, which seems to be working now that I am keto-adapted. Thank you, raphi. I have heard about BG sometimes spiking with HIIT, but I don't know much about it. My first reaction is to think it has *got* to be bad, but I could be wrong. How long does it last? Does it also go down far after? Last time I checked it was in the 140s and it took about 2hrs to get close to the 100 mark. Thing is, I tend to eat within 1hr of working out out so I haven't yet led the experiment of seeing how long it'll take to subside back down to fasting levels. To my mind, intense physical exertion is inflammatory and so if BG spikes during it, it isn't that much of a surprise...but like you I don't know much about that point specifically. To me, it seems normal that BG would spike when exercising in a fasted state when following a LC or keto diet. Granted, the difference here between LC & keto could be significant. However, during HIIT style exercises you're basically telling your body to divert energy (aka glucose) from digestion, intellectual focus, immune functions etc., that are less important in this moment, because - ah!! I'm being chased by a lion! But, again, plausible speculation on my part. Yes, it's almost certainly from cortisol — a fight or flight response to the intensity — that calls for a BG dump. So then *maybe* the best thing to do is use it up by following with less intense exercise? I guess that's one option - a warm down is never a bad idea. Funnily enough, when I tested myself after a LC/Keto meal within 1hr of a 15min HIIT session following a 16h fast my BG levels plummeted to the 60s and on the 2nd reading to the high 40s for a while! Now that, I'm not sure I can explain. My glucose/ketone meter from Abbott is supposed to be good - but maybe it's broken? Whatever it could've been, I certainly felt great, calm and clearheaded (counted back in 7s from 100 normally).